Closely associated with the American Arts and Crafts movement, the mission style staircase features simple horizontal and vertical lines, conveying a solid, handcrafted look. The design movement originated in the late 19th century when people sought a shift from the popular, highly elaborate Victorian styles of the time. Casual, comfortable, and simple, mission style designs let the natural beauty of wood grain shine through. Likewise, mission style staircases are designed to exude simplicity through clean lines and wood tones. This week, we highlight several examples of our mission style staircases and discuss the design options available to our customers. Our first featured mission style staircase is the perfect illustration of this design class. Simplicity and handcrafted appeal are key here. Clean lines and warm oak are casual, comfortable, and inviting. 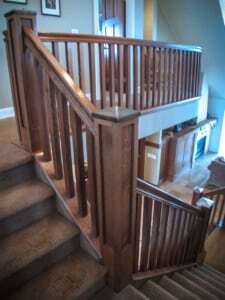 Next, another residential mission style staircase provides a solid, all-American look. The railing, square balusters, and box newels are simple, yet eye-catching. 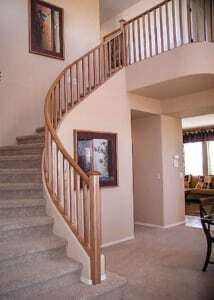 Mission style staircase design is not limited to only straight stairs. 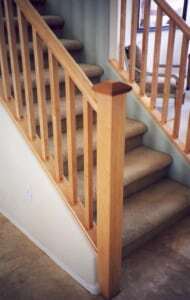 Mission style railing systems can beautifully accent curved stairs as well. Our next featured project is a perfect example. The clean lines of the mission handrail system complement the stair’s arc, giving a casual, handcrafted feel. Our talented craftsmen specialize in constructing wood and steel stair carriages for mission-style staircases, incorporating all types of balustrades available in limitless finishes. Balustrade materials include hand forged iron, glass, stainless steel, cable rail, wood, and metal. Our final featured mission staircase is another example of a unique take on the style. 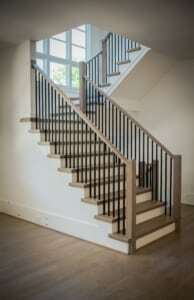 In this project, simple newels and rail are lined with metal balusters, also in a simple, square pattern. This design conveys the simplicity and inviting nature of mission style while adding a modern spin by incorporating metal. Our industry-leading team enjoys working collaboratively with each client to design a staircase and handrail system that reflects his/her unique style. A mission style system is a versatile choice that provides our partner builders, contractors, architects, designers, and homeowners with many customizable options. In each staircase project, we utilize turn-key processes and proven project management throughout all phases of construction. Our dynamic team has earned an excellent reputation for outstanding communication and responsiveness, and we are committed to flawless execution and meeting deadlines in each project. Our goal is not only to deliver an aesthetically pleasing mission style staircase system; we are dedicated to high quality, durability, and safety. 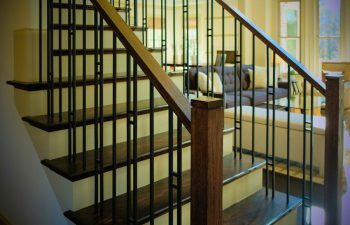 Experts in building code, our team will ensure that your new staircase is code compliant and meets all regulations.